Devon was under the weather yesterday morning and Andy was still away at a sleepover, so I took a swing at doing the “Dad” thing and hauled Jem out to the coast in search of a place to dodge waves and build sandcastles for a few hours. I mean – I was expecting him to do the wave-dodging-sandcastle-building thing. I was just going to sprawl out on a beach towel and murmur approval whenever he looked over in my direction. 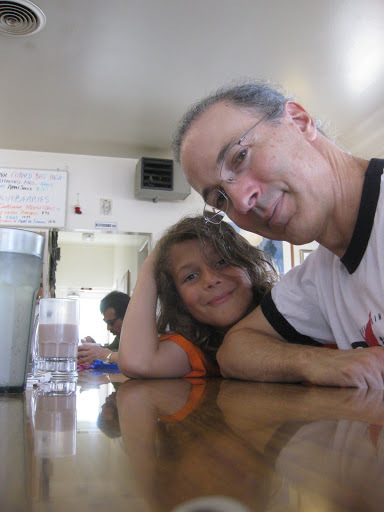 When I mentioned Half Moon Bay, Jem remembered an awesome bowl of clam chowder he’d had somewhere. Maybe somewhere near Half Moon Bay. But maybe in Monterey, or maybe Seattle. But the clam chowder idea lodged in his head, and by the time we’d made it over the hill to the coast, I think he was convinced that if he didn’t have another bowl of this particular ambrosia, then a) he would die an agonizing death and b) I was the worst parent in this arm of the galaxy. It wasn’t that long before noon by that point, so I worked out a compromise: we’d pull into town and look for a bowl o’ chowda before going to the beach. Failing that, we’d eat some sort of lunch, and resume ChowderQuest after we’d spent time getting sand in our knickers. It was only when I turned left on Main, one block shy of Highway 1, that I realized that for all the times we’d “gone to Half Moon Bay”, I’d never actually gone through town. We snaked across a narrow bridge and into unfamiliar territory. “Hey Jem – are you ready for a little exploration?” He started humming the “Indy’s Theme” from Raiders of the Lost Ark. The kids do that when they think I’m lost. But we only got two blocks in before we came to the road closure – Main Street was closed off for the parade. Okay, now this is the sort of serendipity I like. Small town Main Street Fourth of July Parade. I am so there! Snaked our way down a side street, found a place to park, and hoofed back to check up on the action. Parade was to start at noon, so we had time to dig up food. Corner diner looked as local as they come, with the metal-rounded 1950’s tabletops, old jukebox, and elderly fry cook behind the counter who sang out scattered lines from whatever was playing as if in delirium. Every minute or he’d absent-mindeldly come up for air with something like “Start-a spreadin’ da newwwwwwws….” some ten or so seconds after Frankie had sung that line from the jukebox, as if the thought had just occurred to him in a dream. But it was a nice show. No chowder, but Jem wasn’t fazed. He had recalibrated for a turkey sandwich and chocolate milk, and we managed to pay our check just as the parade got rolling. The town fire truck, Foreign Legion, Boy Scouts, Smokey Bear (with a surprisingly large potbelly – isn’t it a little early to be loading up for winter?) down the center of Main St. A pair of vaguely-frightening whiteface mimes working the crowd, handing out … something. Old cars with horns blazing and… at this point Jem was D-O-N-E and ready to hit the beach. But it was a lovely little slice of Americana. Beach: Venice Beach, named, presumably for the not-even-vaguely-a-canal stream that runs from the horse pastures above. Sign warns “DANGER: contaminated water” – ahyup, just like Venice. But the warning is for the stream, and fifty yards windward is the honest-to-Bob beach with folks barbecuing, flying kites, chasing kids, and marveling at the dead seal that just washed up. Dead what?!? Yeah, dead seal. A little unnerving – it seemed intact except for the missing head. Shark? They do hang out offshore. Generally leave humans alone, but are known to love snacking on seals. We reflected on this thought for about 30 seconds, then moved a bit further down the beach. After ten or so minutes gathering seashell fragment treasures (stashed in some pocket that we’ll undoubtedly remember the next time we do laundry), Jem fell in with an older Indian boy on one of those classic games: jump the wave. Or don’t jump the wave. Or fall over when the wave hits you. Or, in its simplest form: get wet and slapped around by the water. Damn, that boy loves water. I joined in the frolic for a bit, then decided that our beach towel was in danger of blowing away if it didn’t have a grownup sprawled across it, half asleep with hat over face, and excused myself to remedy the situation. Must’ve been nearly an hour later that Jem sauntered over and declared himself done. We pulled up camp shook the sand off, and piled into the car. He was asleep before we hit Hwy 92 coming back over the hill. Yeah – now this is what the Fourth of July should feel like, shouldn’t it? I mean, except for the dead seal part.